As I talked about in a previous post, we took a road trip this past year up to the Yukon, northern BC, and Alaska. You can read about how we did it and where we went in Part 1 and Part 2. I also wanted to cover the top 10 highlights while we were there. I read a lot of travel blogs, but found that very few travel bloggers have done the Yukon or Alaska thoroughly. Add to that the search words 'family-friendly' or 'baby-friendly' and you find almost nothing online. 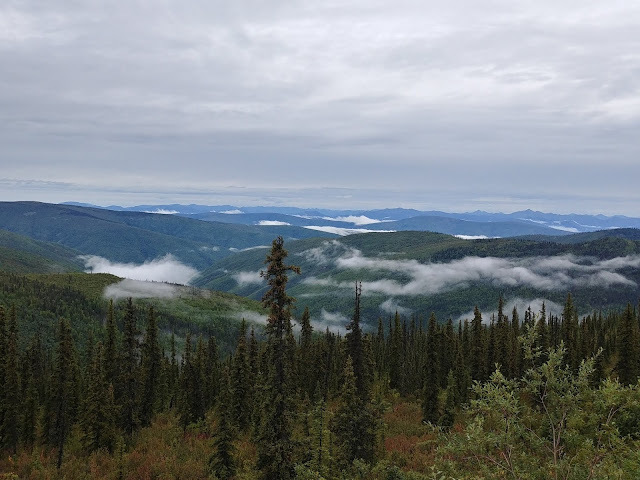 The travelyukon website is pretty helpful at highlighting a number of good options depending on season, but travel blogs can get really specific about where to eat, stay, recreate, etc. And then trying to find these details including a 'baby-friendly' filter. Not so easy. So here's a few of our faves that worked well with our little one. This was a bucket list item while we were travelling for Chad. He just had to do it, and he took the task very seriously. 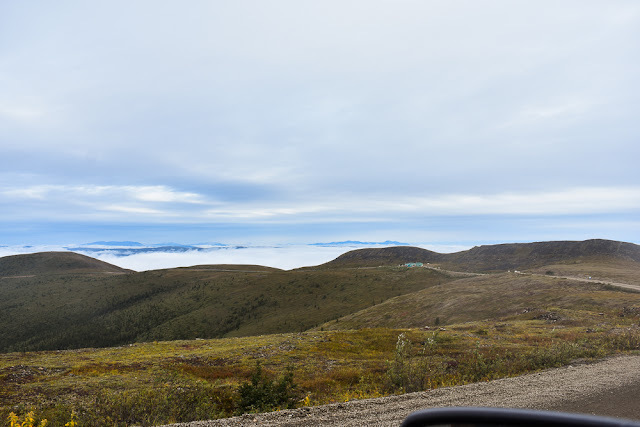 Just slightly south of Dawson City as your coming into the city you'll pass several forest service roads (FSRs) on the left and right as well as some smaller neighbourhoods and some industrial outfits. Fairly well marked on the left is Bonanza Rd. (FSR). 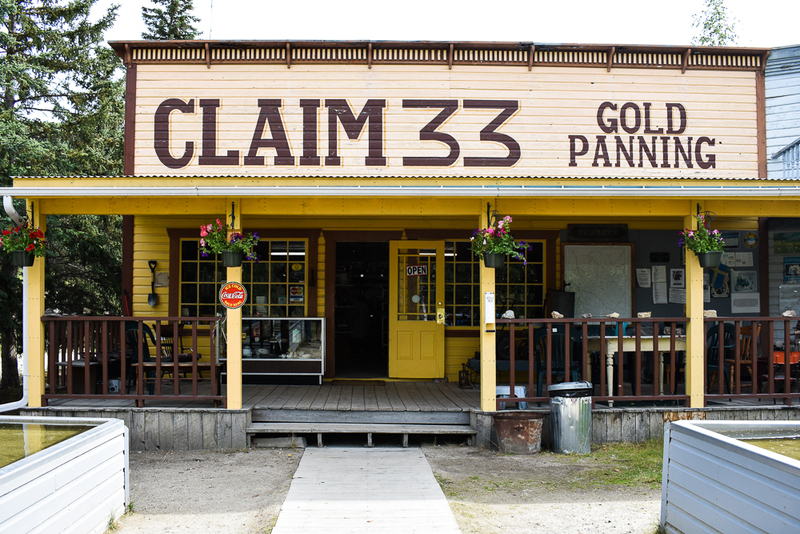 You turn here and hit Claim 33 Gold Panning at kilometre 10. 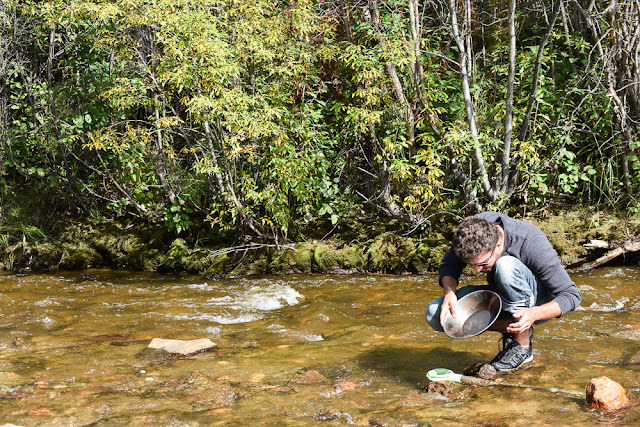 Here you can pan for gold in troughs that are already set up for you for $15. Or head up Bonanza Rd. a little further to Claim 6 where the gold panning is FREE. However, bring a pan and shovel or rent this at Claim 33 for $2. We ended up at Claim 6 and spent 45 minutes panning for gold in the cool water glacial creek. Eli and I hung out on a blanket next to the creek and had a little picnic while Chad hung out in the creek. Such a relaxing afternoon. Chad did find some pieces that looked like gold, but ended up being other minerals. People have though been successful at this spot. 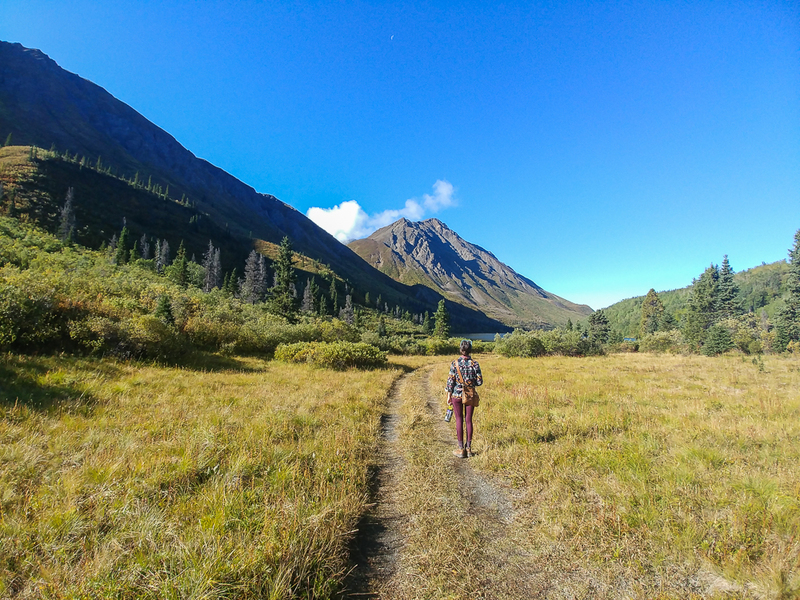 I think I left a little bit of my heart in Kluane National Park. 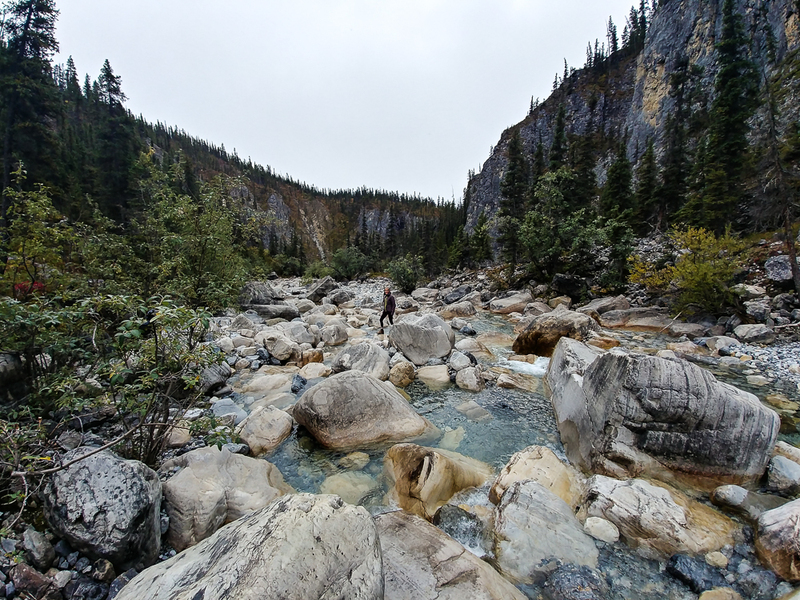 This was easily my favourite natural space in the Yukon. If I'm being honest the whole of the territory that you can drive through is pretty beautiful and there are definitely spots (Tombstone Territorial Park or the Southern Lakes Region) that we didn't get to see. 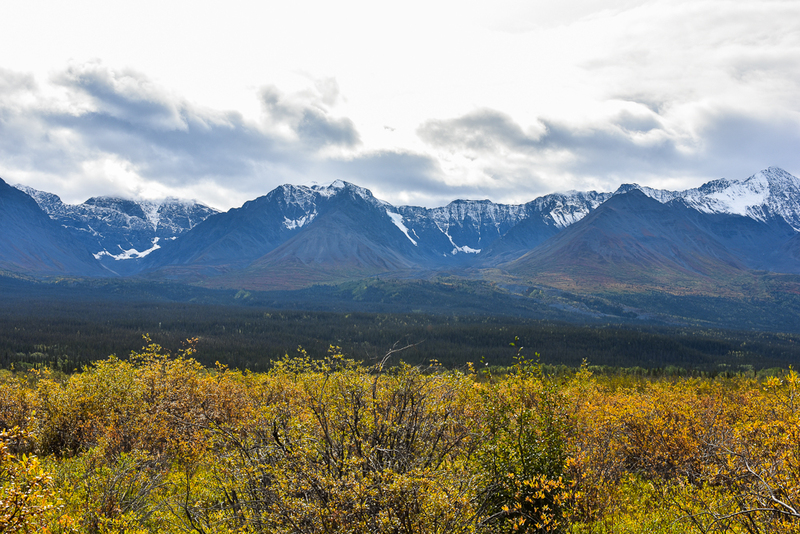 Kluane though showcases that timeless Yukon Territory landscape. Also, the hiking especially between Haines Junction and Haines, AK. There were so many really great hikes off of the highway between these two places with a wide span of difficulties and timeframes. 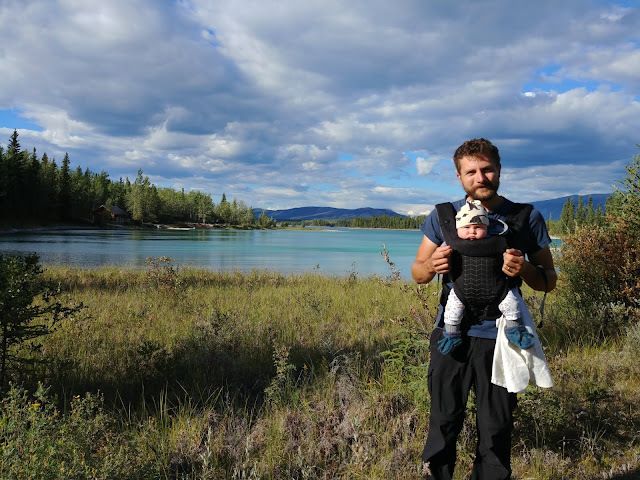 We hiked out to St. Elias Lake with Eli in a front carrier. This was a low key half day hike that leads to a gorgeous lake with a camp site and fire pit. We had some lunch and hiked back out. I recommend stopping in at the visitors centre in Haines Junction. They have pamphlets there that list all the campsites and hiking trails along this stretch of highway. Seriously worth pulling off the road and stretching your legs. 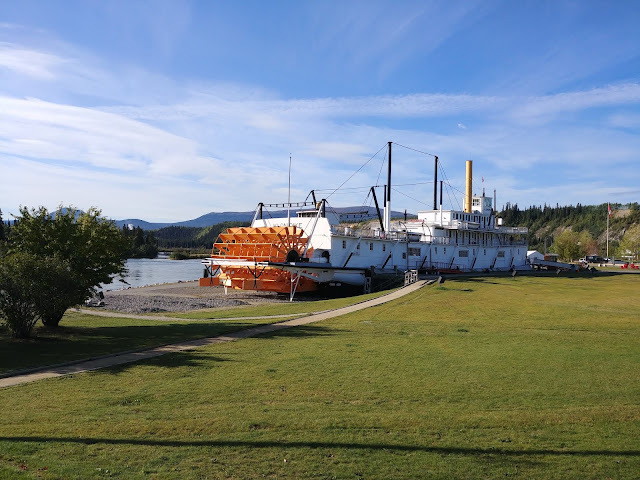 Just across the Yukon river from Dawson City, at the far end of the Yukon River Campground is this old sternwheeler graveyard. Towards the end of the gold rush these old sternwheelers were beached here when not being used. Eventually as the need for resources to the area dwindled, so did the need for these sternwheelers and they were left where they were moored. Time and exposure has definitely taken its toll. This is the only one you could see from the shoreline, but there were lots of trails going back into the woods where you could see other sternwheelers just as big that had succumb to the same fate. We counted five in total in and amongst the forest!! Note that it is not a maintained trail to access this part of the Yukon river. You walk to the end of the Yukon River Campground, past the yellow gate that marks the end of the campground and out onto the beach, and then down the beach aways. You can't miss it. Clearly. Such a cool town. The main street is where most of the tourism is geared towards with cute little shops and cafe style restaurants. But be sure to walk the streets around the rest of the town. There are old historical buildings everywhere with a few sinking to their fate like this one. And so many hole in the wall restaurants or tiny little shops with artisans selling their wears. We spent more time here then anywhere else. If you can hit your timing right, you really don't want to miss their summer market. It was full of really talented artisans and local farmers. Also, oddly enough the most popular item grown in the area is romanesco. I didn't know it grew in temperate, dry summer climates. This. drive. is. breathtaking. Technically this is a border crossing sort of drive as you cross into Alaska from Dawson City on this highway. However, you have lots of opportunity to turn around before the border if your just taking a day trip out from Dawson. Its called the Top of the World Highway because it truly feels like you are on top of the world. This road travels through beautiful rolling hills that are high above the clouds with the deep valleys of this countryside buried below. There is also nothing close to civilization (besides the border) until you get into Alaska and the road is not paved. It's not so bad that you need to worry about spare tires, but you'll definitely be driving slower then the speed limit. There are also no guard rails or dividing lines so watch for other traffic (we didn't see much) and wildlife. We stopped at a few particularly beautiful spots to snap some photos as the scenery in every direction is beautiful. If its on your bucket list to see wildlife then absolutely fit this half-full day trip into your plans. The Yukon Wildlife Preserve is off the highway just a little ways north of Whitehorse. There is good signage to get you there and at $15/person or $35/family it was well worth the time. The preserve provides homes for several different species of animal with 20-30 acre fenced in areas for the animals to roam. 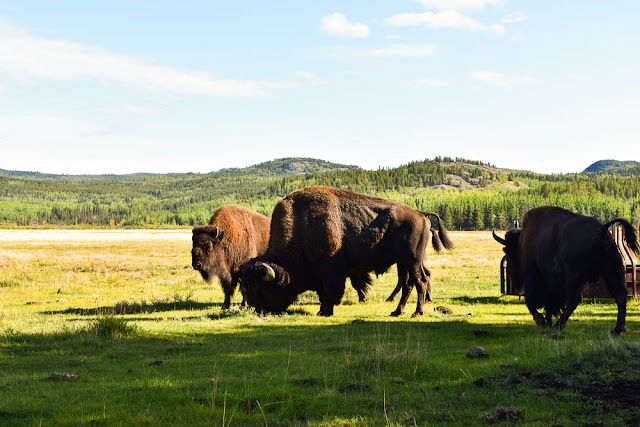 They provide a safe home to bison, elk, caribou, mountain goats, big-horned sheep, lynx, different species of fox, moose, and deer. The path takes you in and around all the roaming areas, protected by fences. There are plenty of places to stop and have a picnic lunch and bus tours are offered if mobility is an issue. It took us about 3 hours to walk the property. Definitely spend an afternoon and evening taking in downtown Whitehorse. Start your afternoon by stopping in at Baked Cafe to grab a delicious baked good and a hot drink and walk on down to the Yukon river to marvel at and tour the S.S. Klondike. Head back into the downtown area and peruse some of the local artisan shops, and outdoor adventure stores. There is an especially cute little knit shop called the Itsy-Bitsy Yarn Store. Stop in for dinner at the Burnt Toast Cafe or the Miner's Daughter for a slightly more upscale feel. Be sure to also check out the Yukon Brewing Company in Whitehorse. They're taps change regularly and they always have a couple cocktail options for those non-beer drinkers in the crowd. This was definitely a highlight for Chad and I. This was my absolute favourite campground. Boya Lake is a small lake off of the Cassiar highway in northern BC. The water is tropical blue and very clear. Don't let the colour deceive you. It is glacial cold. Chad and I took a quick dip while Eli was napping, and by quick I mean we ran in as fast as we possibly could and then ran out as fast as we possibly could. I just had to feel such inviting looking water. 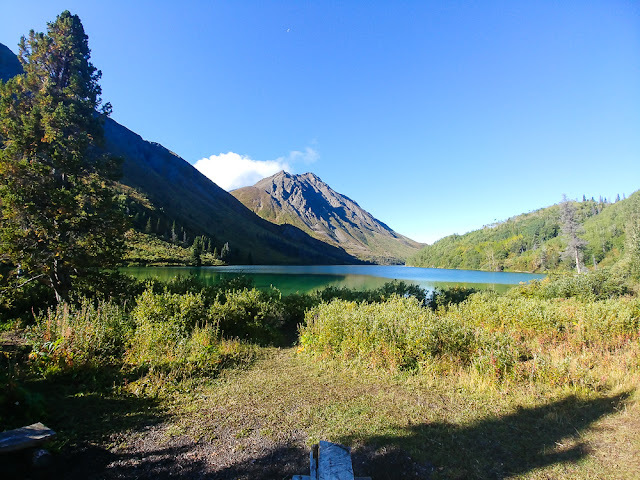 There are two beautiful, short hikes on either side of the lake, a kids playground along the one beach, and wheelchair accessible campsites. It struck me as one of the best long weekend, big family, lots of kids campsites going. We would've stayed much longer if we weren't eager to see other places. Liard River Hotsprings is also a provincial campsite that we stayed at in northern BC. 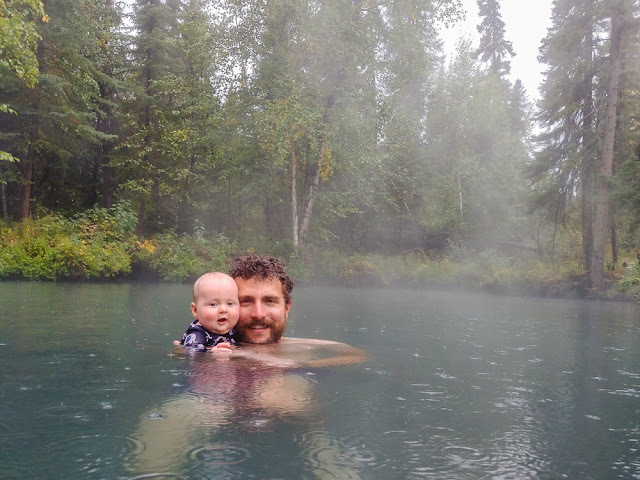 It is a sought after destination by many travelling north as the hotsprings have been preserved to feel as natural as it began while still providing the comforts of decking and change rooms. We probably hung out in the pools for an hour and a half. It was pretty chilly outside and raining and when you're looking ahead to a cold night of camping, getting out of the water is pretty hard. There are three pools with the highest of the three being particularly hot and the lowest being just warm enough for a baby. It's definitely a place where mother nature once again blows your mind. There is a $22/night fee to camp and a 5$/day fee to swim. This is a hidden gem for sure. Somewhere shortly past Muncho Lake Provincial Park is Baba Canyon. It is right off the highway and only marked by a small blue and yellow square sign briefly outlining the hike. If you blink, you'll miss it while you're busy snapping pictures of the herds of Bison and Elk off the side of the road. There are several of these hiking signs through the northern rockies and many great hikes. We chose Baba Canyon on a whim (I was tired of driving and Eli was done with his car seat). We spent an hour hiking back into the canyon across the clear glacial stream several times through layers of different sized boulders. We only hiked for about 45 minutes before Chad deemed it too technical for a baby. I will definitely be finding some way to get back here and finish this hike. We did it at the beginning of September and it was -2 degrees Celsius outside so many plan for a summer hike if you can. Hope this helps anyone planning a trip. If you want more baby/family-friendly suggestions or have some of your own please comment below or send an email.